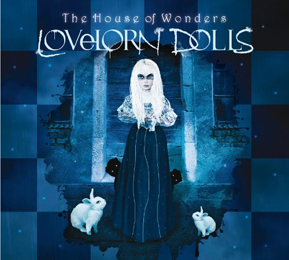 In 2011, under the Lovelorn-moniker, the duo released the EP An Intense Feeling Of Affection, and this album, The House Of Wonders, is the official debut full length, which has a total running time of fifty one minutes. The stuff, by the way, was produced by Victor Love – think Dope Stars Inc. or Omega Lithium. With The House Of Wonders, LadyHell (vocals, lyrics -in both English and French- and arrangements) and Corpus Christi (instruments, programming, co-production and music) offer a catchy album with emotive yet open-minded atmosphere. The whole combines elements from Electro-Pop, Goth-Rock, Gothic Metal, Indie Rock, Alternative and Classical Music. It’s not the kind of melancholic love-song sadness, yet rather a symbiosis of multi-dimensional ambiance with both poppy-like prediction and sudden surprises. Fans of Autumn, Evanescence, Lacuna Coil or Garbage need to check this out! PS 1: the disc comes with the Depeche Mode-cover In Your Room (a room that fits in this House of Wonders). PS2: there’s a limited edition as double-album. The second disc consists of remixes by e.g. Diskonnekted, Helalyn Flowers, Implant and Psy’Aviah.